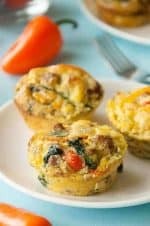 These paleo egg muffins are jam packed with flavor and come together relatively quick. They are full of color, texture, and healthy ingredients. Place the ground sausage in a sauté pan and heat on medium high. Break up the pork into crumbles with a spatula as it cooks. When the pork is half way cooked, add 1 T. of olive oil, onions, peppers, and oregano to the pan. Saute until the onion is translucent. Add the spinach to the pan and cover with a lid. Cook for 30 seconds, remove the lid and toss the ingredients. Spinach should be wilted but still bright green. Remove from heat. Place the eggs in a large mixing bowl along with the pepper, salt, and milk. Whisk together until eggs are well beaten. Add the sausage and vegetables to the egg mixture and mix in until well distributed. Divide the mixture between the greased muffin tins(12 total), making sure that each tin has a somewhat equal ratio of eggs/fillings. Bake in preheated oven for 18-20 minutes. Cool for a few minutes and remove from tins, loosening the edges first with a knife.